Absorbs through the leaves only so killing power won't spread to non-target plants through soil. Continuous spray. No more hand fatigue. Precision control for maximum accuracy, easy-to-use. May be used on patios, walkways, driveways, gravel and mulch beds, around shrubs or trees, in flower beds, and along fences. Spray the weeds or grasses you want to kill until thoroughly wet. If a desirable plant is accidentally sprayed, rinse off immediately with water. People and pets may enter treated areas after the spray has dried. All ornamental flowers, trees and shrubs may be planted one day after application. Lawn grasses, herbs, vegetables and fruit may be planted 3 days after application. 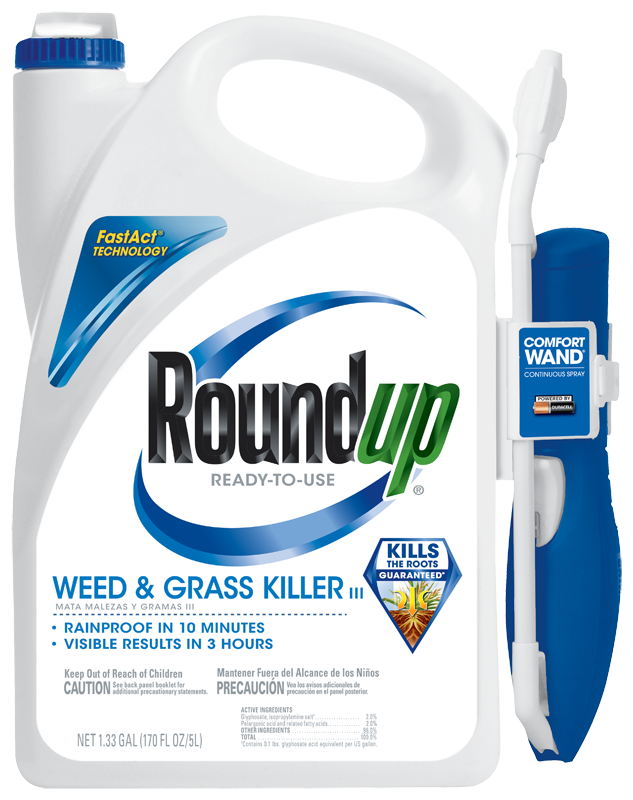 The main active ingredient in Roundup® Weed and Grass Killer products is glyphosate. It works by targeting an enzyme that is essential to plant growth. 2% Glyphosate, 2% Pelargonic and other related fatty acids. No mixing and no measuring, you just pour and go.